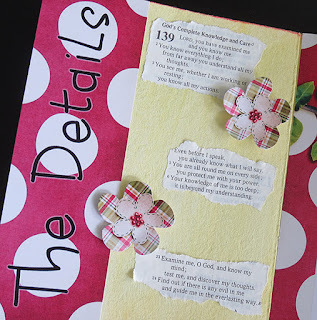 This monthly challenge is hosted by Patter Cross so if you have not come from Patter's blog please visit her blog here and read her Bible Teaching on her chose theme for this month - The Details. 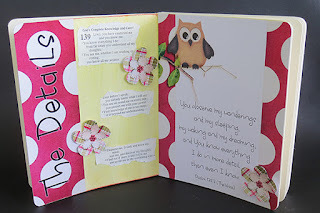 Because my life is fairly busy and I was finding it to much pressure to create my canvas art for this challenge I have now chosen to do something smaller and use a lot of digital artwork for it along with old bibles I bought from Op shops. I did paint the pale green background for my page this month. I am using a child's board book which I peeled the top color paper layer from each page. I will go back and do the first two challenges on the previous page to this one. The book is not big enough for 12 full double pages. When I do #1 and #2 I will share them. I really enjoyed this month's challenge and the scripture I chose to work with - Psalm 139:3 is worded so well from The Voice Bible. 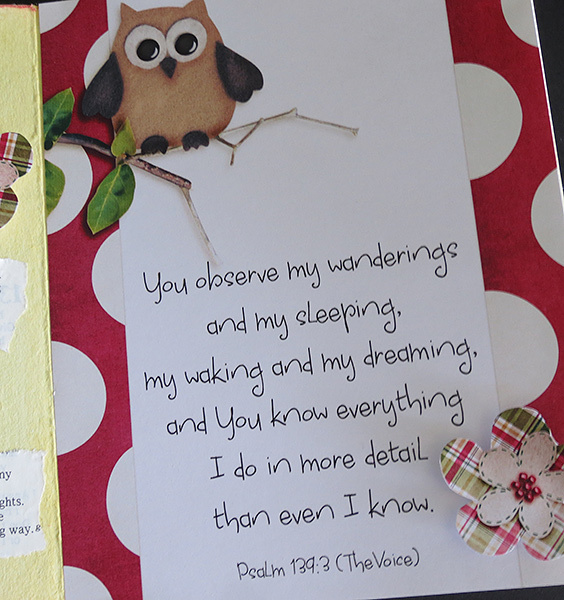 It is so encouraging to know how our Great God knows all the details of "ME' and yet still loves me so much. I found the title in the Good News Bible I am tearing up for my artwork had the perfect title for Psalm 139 - " God's Complete Knowledge and Care" so I have included that on my page.